At the 2016 Leadership Development training in Haiti more than 140 pastors and leaders participated in Bible study and learned new ways to grow their ministries. They welcome the opportunity to share and encourage one another. Get to know two of the pastors that oversee the eight CWO churches in Haiti: Pastor Icher from the church in Ouanaminthe and Pastor Elino leads the church in La Victoire. I decided to go to seminary because I felt God’s call upon my life. I also wanted to know more about God’s Word so that I might teach those who do not yet know God and lead them to Christ. How long have you been a pastor at your church? I have been in the pastorate in the church at least for the past 13 years. How do you and your church reach out into the community to tell others about Jesus? We visit the people in the community. We do door to door evangelism. We plan conferences for the Christian and the non-Christian youth. We encourage people to attend church services when we meet for Bible study, prayer meetings and worship services. What is the biggest joy and the biggest challenge in being a pastor in Haiti? Our greatest joy is the fact that the church is growing both spiritually and in number every day in spite of the problems we face in the ministry. The greatest problem a pastor in Haiti is facing is an economic issue because the churches do not have the capacity to support their pastors and their families. Because of that, the ministry becomes even more difficult when they want to reach a goal for the church. What would you like others to know about your church and the people who attend and serve at your church? The church needs a lot of prayers. The church needs more spiritual and material blessings. The church needs more love for one another. The church needs to establish more relationships with other brothers and sisters around the world so that we can pray one for another. 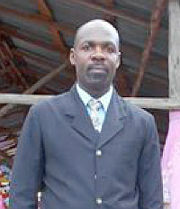 I decided to become a pastor because I felt the call of the Lord upon my life. I always had the desire to study God’s word so that I could become a trained pastor. In my area there is a great lack of trained pastors. I also wanted to be well equipped to evangelize those who do not know Christ. I have been in the pastorate for the last 9 years. We hold evangelistic activities in the area every semester. My biggest joy is to see that the church is growing in number and in their walk with the Lord. The biggest challenge in being a pastor in Haiti is the great challenge of meeting the needs of my family without neglecting the ministry. I want everyone to know how the Lord has blessed the church over the past 9 years. More than over 50 new members have been added to the church over the past 9 years. Some families are divided; many souls have come to Christ. In Haiti, particularly in the rural areas, the churches can in no way provide for the needs of their pastors.